Immense northern storms on Saturn can disturb atmospheric patterns at the planet’s equator, finds the international Cassini mission in a study led by Dr Leigh Fletcher from the University of Leicester. This effect is also seen in Earth’s atmosphere, suggesting the two planets are more alike than previously thought. Earth’s QBO is regular and predictable, repeating every 28 months on average. However, it can be disrupted by events occurring at great distances from the equator of our planet—and a new study reveals that the same is true of Saturn’s QPO. Cassini observed Saturn from June 2004 until 15 September 2017 when the mission concluded by plunging into the gas planet's atmosphere. 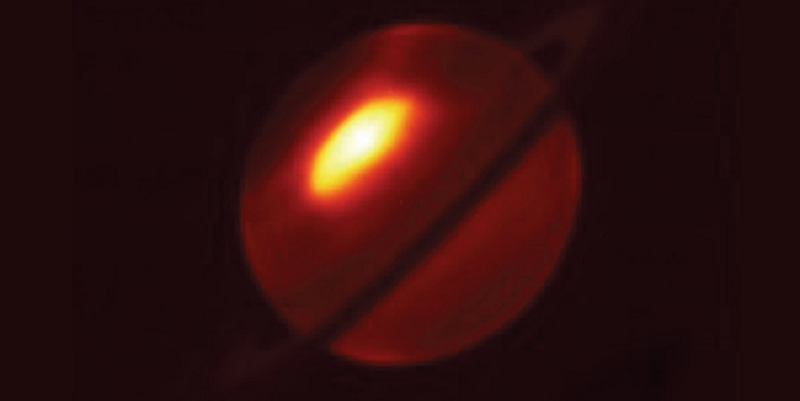 To better understand Saturn’s QPO, Fletcher and colleagues studied data from Cassini’s CIRS covering this entire time period. This storm was known as the Great Northern Storm. Such storms occur roughly once every Saturnian year, which is equivalent to 30 Earth years. The timing of the storm was thus serendipitous, allowing Cassini to observe it in detail from orbit around the ringed planet. Although the influence of Saturnian storms was known to be substantial, this study suggests an even wider influence than expected, and confirms a connection between Saturn’s QPO and remote, distinct events occurring elsewhere in the planet’s atmosphere. On Earth, this relationship between distant events in a planet’s climate system is known as teleconnection. Meteorological patterns across the globe are known to be delicately linked together, and can affect one another quite significantly. A key example of this is the El Niño Southern Oscillation, which can influence temperatures and climate patterns across the Earth. “It’s remarkable to see this process occurring on another planet within our Solar System—especially one that’s so vastly different to our own,” says Nicolas Altobelli, ESA Project Scientist for the Cassini-Huygens mission.